Olentangy’s Katie Berberick, left, and Liberty’s Jenna Lickovitch battle for possession during the first half of Monday’s Division I, Region 1 tournament game in Powell. 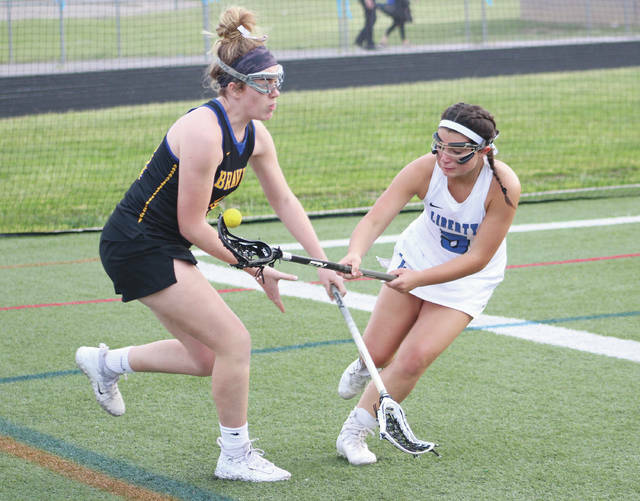 The Olentangy Liberty girls lacrosse team scored six straight goals to take a 10-2 lead late in the first half. Olentangy then rallied to get it as close as two late in the second half of Monday’s Division I, Region 1 semifinal in Powell, but the Patriots held off the rally and won 14-11. Madison Rapier led the Patriots with four goals, Molly Bursinger and Emma Shear added three apiece and Grace Buckey led with a pair of helpers. Maddie Harrington had 11 saves in goal for Liberty. Elise Harder had five goals to lead third-seeded Olentangy. Kenzie Sklar dished out three assists and Abby Derick stopped eight shots in goal. Mother Nature played a roll in this one as well. Play was halted when lightening was spotted after a Molly McCormack goal with 1:51 left and it never resumed. Liberty advances and will face top-seeded New Albany Thursday at a time and neutral location to be determined.